The East India House on British 18th Century Tokens. An enquiry which might benefit from other collectors' or local historians' knowledge. If you have any information relating to the issues discussed here please use the following link to email the author. During a contribution to Members Evening at the London Numismatic Club meeting on Tuesday 3rd June 2003 I discussed the few references to the East India Company found on British numismatic material. The 18th century tokens provided some interesting examples, raising a number of questions. This common token dated 1792 uses an obverse inscription of "EAST INDIA HOUSE". The edge reads "PAYABLE AT I FIELDINGS MANCHESTER", and the reverse shows the Grocers Arms. A token using the same dies as the Lancashire piece is listed under Yorkshire Dalton & Hamer 14, because its edge reads "PAYABLE AT JOHN DOWNINGS HUDDERSFIELD", and is described as very rare. Shown above, using slightly different dies, is the token dated 1793, which is common. The reverse shown, D&H 15a, has a different edge: "LONDON, BRISTOL AND LIVERPOOL". D&H 15 has the same edge as D&H 14. The 18th century Token series is full of rare tokens made for collectors, or to avoid redemption, as well as those for genuine traders. 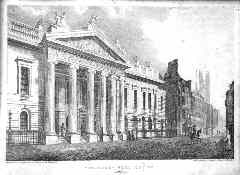 The question arises, were there local buildings in a number of towns using the East India name, or is this a representation of the Company's headquarters in Leadenhall Street, London? In this case it should be the London building since it is unlikely two towns would have similar buildings. The first headquarters was built in 1648 and replaced between 1726 and 1729. 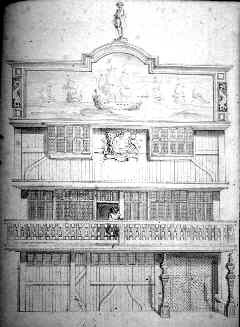 The second East India House was enlarged between 1753 and 1754. The third rebuilt with a grand design between 1796 and 1799. At the time of my talk I could only find etchings of the first and third designs and I showed a drawing of 1825. The one shown above dated 1810 was obtained for me by Philip Mernick then president of the London Numismatic Club. He was also able to find an example of the second building as shown below. This comes from Harrison's History of London published in 1770, and there are sufficient similarities to conclude that the token engraver adopted contemporary representation for his token dies. The chimneys and set-back top storey are not depicted on the token, but anyone standing close by wouldn't see them. There are other 18th century tokens that use the inscription "INDIA HOUSE" and it is instructive to make further comparison. This common example dated 1794, and others dated 1795 and 1796, has M Lambe & Co as the issuers, describing themselves as tea Dealers and Grocers, Bath. Probably enough information for tokens to be redeemed, though they occur as part of an extensive series using Bath buildings and streets, most of which are quite rare and meant for collectors. Obverses and Reverses are sometimes used with different pairings, also for collectors. Turning to the building depicted it is similar to the Manchester and Huddersfield pieces and to the second London East India House. 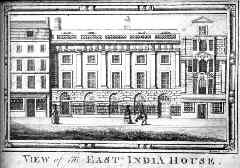 It would be useful to know if amongst contemporary Bath buildings there was one known as East India House, and what it looked like. Lambe & Co. also issued the farthing shown above. Their name is shown on the tea chest as well as two Chinese characters, and the reverse inscription "STALL STREET BATH" should tie down where the shop was. Despite the smaller flan the building is again quite similar. Dated 1793, a year earlier than the earliest Bath tokens, the issuers name "HAWKINS BIRD" appears on the obverse outer legend and their address "WINE STREET No2 BRISTOL" on the inner legend. An extremely rare version exists without the address and must be for collectors. The reverse building has similar proportions, but instead of entrance doors and steps, either end appears to have arches, with the front cobbled surfaces being carried through them. The roof is different and the inference is that this building is the India Tea Warehouse in Bristol. Did such a building exist? The title is curious because although today we are familiar with the phrase "India Tea" and would expect it to come from estates in northern India; this could not have been so in 1793. At the time of issue of this token the East India Company obtained its tea from China which accounted for 60% of its total trade. The tea plantations in India and Ceylon were not developed until the second half of the nineteenth century. The tea chest on the Lambe farthing makes it clear that they knew it came from China. As the trade was dominated by the Company the phrase meant tea supplied by the East India Company which was then abbreviated to "India Tea". If anyone has any contemporary references to this or other buildings mentioned, or information that they could not have existed, I would be most interested.